It has been clearly established that poaching for ivory poses a major threat to the survival of elephants in Africa, and that poaching for a variety of products has likewise contributed to their sharp decline in many parts of Asia, especially the Indochina region. There is universal consensus that poaching of the elephant has to be controlled, but there is much less agreement whether this can be achieved through a complete ban on trade in ivory. The regulation of the international ivory trade has been a contentious issue during the past two decades. We need to consider objectively how poaching of elephants could be controlled both through law enforcement on the ground as well through regulation of trade in their products. The manner in which elephants are poached varies considerably from one region to another. Uganda's elephants were indiscriminately slaughtered by soldiers during the internecine strife of the 1970s. In southern India, elephants have been poached opportunistically by small groups of villagers armed with crude firearms such as muzzle-loading guns, as well as by larger, better organized gangs armed with more advanced weapons. Elephants in remote areas of Cambodia's Cardamom Mountains are killed by traditional hunters operating singly or in very small groups. Elephants are still hunted across Indochina by local people using old-fashioned weapons such as poisoned arrows. Law enforcement capabilities also vary widely across the range states. Kenya has a professional wildlife service to manage and protect elephants. South Africa's national parks service holds a tight rein on their elephant populations. 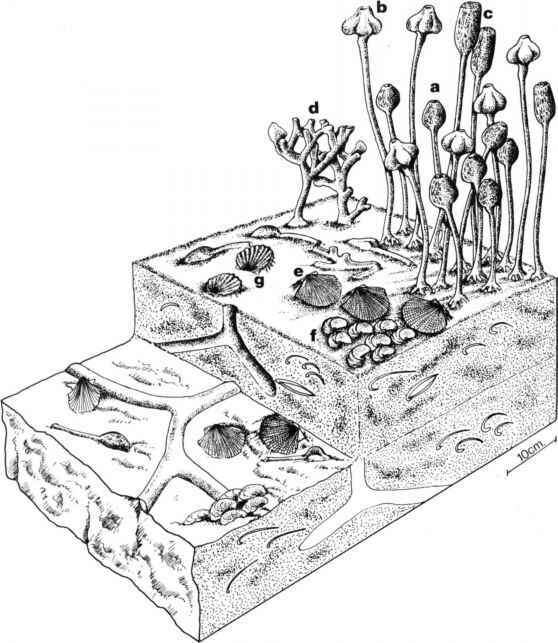 On the other hand, vast tracts of rain forest in central Africa are outside the pale of any effective law enforcement agency. Likewise, in Asia, countries such as India have an elaborate network of protected areas, laws, and enforcement agencies trained to manage and protect wildlife, while others have little capability or reach. Thus, there can be no universal solution to combating poachers in the field; each country and region will have to develop its own appropriate models for law enforcement. Law enforcement in wildlife areas of most Asian countries is usually the responsibility of departments of forestry or wildlife, but limited experiments with police or paramilitary forces have been tried. There are hardly any objective analyses available of antipoaching efforts in Asian regions, although success stories of protecting species such as elephants, tigers, or rhinos do exist for individual protected areas over short time periods in countries such as India. Data on wildlife law enforcement in Zambia's Luangwa Valley have been examined in some detail by two studies that are worth describing in brief. From about 35,000 elephants around 1975 in the Luangwa, the numbers declined through poaching to 15,000 by 1987, and then to 2,400 by 1998 mainly because of movement of elephants out of the area (about 1,000 elephants were poached). Serious law enforcement efforts began only in 1979. Nigel Leader-Williams and E. J. Milner-Gulland argue, on the basis of data for 1979-1985, models, and crime theory, that improved chances of detecting poachers will be a greater deterrent than will an increase in penalty. In Africa, a potential law breaker is likely to value an uncertain distant future much less than the present or immediate future. A stiff fine is unlikely to be paid. Long prison sentences are not necessarily a deterrent when the future is not valued. A very high penalty is likely to turn a part-time local hunter (of small game) into a more serious hunter of species such as elephant or rhino. Programs to provide alternative economic opportunities are more likely to succeed in weaning away local poachers compared to gangs from outside. Local people, however, may be more likely to provide information to authorities about the presence of poachers from outside, resulting in greater detection and less poaching. With organized gangs, the dealer backing them is rarely caught and may continue to fund more poachers even if gang members are caught. The courts may also place a lower priority on wildlife-related crimes than do the enforcement authorities. Under these circumstances, the primary emphasis should be on improving detection of poachers, with secondary emphasis on achieving stiffer penalties. The severity of penalties should be proportional to the crime (thus, the same prison sentence should not be awarded for killing 1 elephant or 10 elephants). There are two sides to law enforcement: conventional patrols in the field to deter and detect poachers and investigations to identify and arrest poachers and dealers. In 1988, the Luangwa Integrated Resource Development Project (LIRDP) began law enforcement operations. Poaching of elephants decreased substantially. 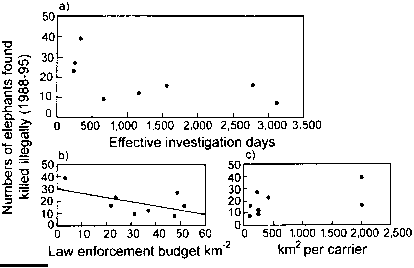 Examining enforcement data for 1988-1995, Hugo Jachmann and M. Billiouw concluded that investigations were much more effective than foot patrols in curbing poaching (fig. 9.6). Each man-day spent in investigation was equal to 23 man-days of field patrol. Even considering the higher expenses incurred in investigations, the overall relative efficiency of investigations over patrols was fourfold. Statistical analyses showed that cash rewards, density of patrol scouts, number of investigation days, emoluments to personnel, and total enforcement budget were positively related to a decline in elephant poaching. Jachmann and Billiouw computed the optimum levels of enforcement in Luangwa as one scout per 24 km and expenditure of $82 per km , lower than a more general estimate made earlier of $200/km for African parks. They concluded that variations in elephant poaching during 1988-1995 in Luangwa could be explained merely by resource allocation without having to invoke the international ban on ivory trade. seems to be inadequacy of investigation and prosecution capabilities. I have long advocated the strengthening of intelligence for identifying dealers of illegal ivory and capabilities for investigation and prosecution of offenders in southern India, in addition to increasing field patrolling efforts. Control of poaching is much more challenging in countries such as Myanmar, Laos, and Cambodia, where the reach of enforcement agencies is much more limited. In Asia, the need for greater involvement of local communities in protecting wildlife is being increasingly recognized. The Asian models of community involvement in antipoaching efforts will have to be different from African models, which emphasize wildlife harvest and utilization. How countries are controlling poaching?